Sinopsis:Hercules Poirot es uno de los personajes más carismáticos de la historia de la novela negra. Creado por Agatha Christie (1890-1976) en 1920, el detective belga protagonizó más de treinta novelas, y 50 relatos cortos publicados entre 1920 y 1975, varias películas y series de televisión, y hasta tuvo su propio obituario en «The New York Times» (el 6 de agosto de 1975 apareció en el famoso rotativo: «Muere el detective Hércules Poirot»). 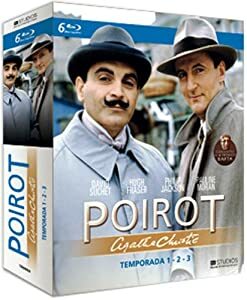 Poirot ha sido interpretado tanto en la televisión como en el cine por varios actores, como Albert Finney, David Suchet, Peter Ustinov, Ian Holm, Tony Randall y Alfred Molina. If you see this message, it means that your browser does not support frames or it is disabled. To download files from our website it is essential that this option is enabled. If you see this message, it means that your browser does not support frames or it is disabled. To download files from our website it is essential that this option is enabled. If you see this message, it means that your browser does not support frames or it is disabled. To download files from our website it is essential that this option is enabled. If you see this message, it means that your browser does not support frames or it is disabled. To download files from our website it is essential that this option is enabled. If you see this message, it means that your browser does not support frames or it is disabled. To download files from our website it is essential that this option is enabled. If you see this message, it means that your browser does not support frames or it is disabled. To download files from our website it is essential that this option is enabled. If you see this message, it means that your browser does not support frames or it is disabled. To download files from our website it is essential that this option is enabled. If you see this message, it means that your browser does not support frames or it is disabled. To download files from our website it is essential that this option is enabled.